The idea of a 15-disc box set to commemorate the release of what was, in 1973, a single vinyl LP clocking in at a mere 46 minutes might seem a tad excessive, but when you're talking King Crimson and the seminal Larks' Tongues in Aspic, it's a whole other story. Beyond being an important addition to the legendary progressive rock group's 40th Anniversary Series of new stereo and surround sound mixes from Crimson cofounder/guitarist Robert Fripp and guitarist/keyboardist/singer Steven Wilson-a bandleader in his own right, first with Porcupine Tree and, more recently, with solo projects including the recently released Get All You Deserve (Kscope, 2012)-Larks' Tongues in Aspic represents a particular paradigm shift from a group whose In the Court of the Crimson King (DGM Live, 1969) was one of those rare debuts that literally shook the rock world. A 15-Disc Box Set? Really? 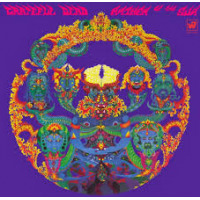 By 1972, Crimson had released four records-in addition to In the Court, there was 1970's transitional In the Wake of Poseidon and nightmarish, utterly unique and too-often-overlooked Lizard, as well as 1971's Islands (all already reissued in 40th Anniversary Series editions by DGM Live and Panegyric)-and had already seen more players come through the group than most see in a lifetime. The original lineup disbanded following a successful American tour on the heels of In the Court, leaving just Fripp and lyricist, lighting engineer and occasional sonic manipulator Peter Sinfield to carry the torch forward. Neither Poseidon nor Lizard) had lineups stable enough to hit the road, but Fripp and Sinfield finally hit the jackpot with the Islands band, a live juggernaut (initially, at least) that included saxophonist/flautist Mel Collins (who'd joined Crimson for Poseidon), bassist/vocalist Boz Burrell (taught to play by Fripp) and drummer Ian Wallace. But despite significant touring on both sides of the Atlantic, all was not well with Crimson, something made crystal clear by the post-breakup live album, Earthbound (1972)-a soundboard cassette recording of such poor sound quality that its North American label, Atlantic, declined to release it, leaving only Crimson's UK label, Island, to put it out...and on its budget-line imprint, to boot. By the time Earthbound was released, Crimson had well and truly fractured, with Burrell, Wallace and Collins more interested in blues-based, occasionally funkified rock jams, a significant difference to Fripp's more sophisticated predilections. 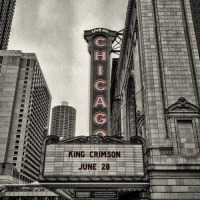 Since the formation of the King Crimson Collectors Club in the 1990s, which began releasing live recordings from Crimson's various lineups, it's become clear that this was not how the group began, though with the exception of Collins (and, long after he left Crimson, Wallace), this was not a band whose improvisational prowess matched the players that Fripp had recruited from the jazz and classical worlds to augment studio recordings from Poseidon to Islands -artists like pianist Keith Tippett, bassist Harry Miller, cornetist Mark Charig and trombonist Nick Evans. And so, Collins, Burrell and Wallace left to hook up with British bluesman Alexis Korner in the group Snape. Irreconcilable artistic differences also created a permanent rift between Fripp and Sinfield and so, by the summer of 1972, there was only Fripp left to carry the name forward. 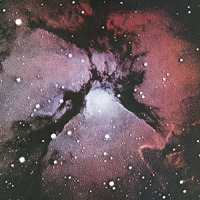 But if Crimson's first four recordings represented something of a quadrilogy, what Fripp had in mind for a new King Crimson was something completely different. While Fripp's guitar work was fundamental to those first four recordings, it was rarely the primary voice; on In the Court, only his silkily sustaining solo on the hard-edged, jazzified opener, "21st Century Schizoid Man," gave any overt indication of just how talented and distinctive a player he was. Elsewhere, while his guitar work was just as fine, and just as harmonically sophisticated, Fripp was far more of an ensemble player. Even when he emerged as Crimson's de facto leader (a role he has publicly eschewed in the ensuing decades), his playing rarely dominated, though he began taking a greater role on Islands, including a career-defining solo on "A Sailor's Tale," and his acoustic work on the first side of Lizard was equally compelling, even if it was often buried in a dense mix that has only since been opened up by Steven Wilson's revealing remix. Still, Crimson was an improvising band from its inception. It may have been labeled a rock group, but with drummer Michael Giles on In the Court and Poseidon, Collins' broader scope on subsequent recordings and Fripp's ever-present jazz-centric vernacular, there's little doubt that it was a rock band with a jazz heart. And so, as Fripp pieced together a completely new lineup for King Crimson, he was looking for players capable of both challenging compositional constructs and open-ended improvisational forays. Cutting his teeth with Yes-another progressive group that was on the ascendancy during the same period as early Crimson, and whose relatively stable lineup and impressive musicianship had, in fact, resulted in the group leapfrogging Crimson in terms of sales and popularity with the triple-punch of 1971's The Yes Album and 1972's Fragile (with its radio hit, "Roundabout") and Close to the Edge (all on Atlantic)-drummerBill Bruford shared Fripp's taste for jazz and improvised music. But by 1972, he'd reached a crossroads with Yes: continue on to even greater commercial success, or look for other opportunities that might not be as lucrative, but would be more artistically fulfilling. Fripp knew Bruford, the Islands band having toured in support of Yes earlier that year. "Bill's a lovely drummer," Fripp describes thinking, in Sid Smith's liner notes, "but he's perhaps too straight for some things...Then I thought of this nut Jamie Muir, whom I'd just met, and I thought, well, Jamie's a great drummer but he's really not straight enough for some of the things I'd like him to do...I suddenly had this vivid idea to use the two of them...and it seems so right." Muir's background was in free improvisation, rubbing shoulders with players like guitarist Derek Bailey and saxophonist Evan Parker-even appearing on a very early (and as-yet-unreleased-on-CD) title, The Music Improvisation Company (1970) for Manfred Eicher's then-nascent ECM Records. What Muir brought to this new Crimson was a degree of unpredictability it had never before experienced, with a percussion rig that took up more floor space than any of the other band members, and included everything from laugh boxes to metal sheets and from chains to mbira (African thumb piano), all played by a roving madman as likely to use a zipper as he was a cymbal or a snare drum. It was Muir that turned this band-and its one and only recording as a five-piece-into another sound that shook the rock world, albeit, perhaps, on not quite the same commercial level as In the Court of the Crimson King (though still selling very, very well). Fripp's new lineup also included violinist David Cross-a relative unknown who came to the guitarist's attention through his then-management company, E.G. and one of its titular owners, David Enthoven. 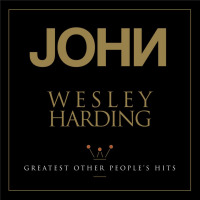 John Wetton was already a known entity for his work with Family, a quirky and eclectic group, to be sure, but one that simply didn't allow the bassist/vocalist the opportunity to grow as a singer/songwriter. Wetton also connected Fripp with Richard Palmer-James, a lyricist with whom the bassist had worked in a number of Bournemouth groups and who, as Richard Palmer, was a founding member of Supertramp, though he left before the group gained traction. And so, with the formation of the band, why is a box set of Larks' Tongues in Aspic important? Why is a box set necessary? The box has been advertized as including "every known note recorded note by the quintet lineup," and, between live recordings and remixes, there are six versions of "The Talking Drum" and "Larks Tongues in Aspic (Part II)," seven versions of "Easy Money," eight versions of "Book of Saturday" and "Larks Tongues in Aspic (Part I)," and a whopping nine versions of "Exiles," not to mention two live versions of "21st Century Schizoid Man"-the one and only track from a previous Crimson recording to make it into this group's repertoire. 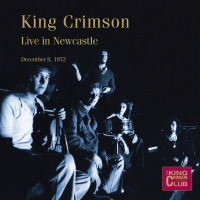 Nine CDs collect a total of six live recordings-two previously released as part of the King Crimson Collectors Club, two previously only available as digital downloads from DGM Live, and two performances never before released. There's also the audio from Crimson's appearance on Germany's Beat Club television show (even more importantly, the video is included on the DVD-A and Blu-Ray discs as well, available commercially for the first time). The fidelity varies widely. There's plenty of lo-fi-all but one of the live CDs coming from audience bootlegs restored by Singleton and Alex R. Mundy to their best possible fidelity, but still determinedly lo-fi. There's ok-fi, in the November 13, 1972 Guildford Civic Hall set, which comes from a restored a cassette tape soundboard recording. And there's close-to-hi-fi in the Beat Club set. But collectively, it's an opportunity to not only experience the short-lived quintet lineup of Larks' Tongues in Aspic in all its freewheeling, improvisational glory, it's also a chance to hear the album's six compositions coalesce over time, with some tracks considerably different at the group's first-ever live show at Frankfurt's The Zoom Club, compared to both the Portsmouth Guildhall show just two months later and, ultimately, the studio recording that was made between January and early February, 1973. Muir's departure from the group in order to follow his growing interest in Buddhism, came as a complete surprise, and following the quintet's first live performance of 1973 on February 10 at London's renowned Marquee Club, Crimson would carry on as a quartet for the next two years-its live shows well-documented, in particular, on The Great Deceiver Live (1973-1974) box set and the live/studio combo of 1974's Starless and Bible Black (reissued in a 40th Anniversary Edition by DGM Live in 2011). In Erick Tamm's book Robert Fripp: From Crimson King to Crafty Master (Faber and Faber, 1990), Cross succinctly sums up Muir's impact, "We all learned an incredible amount from Jamie. He really was a catalyst of this band in the beginning and he opened up new areas for Bill to look into as well as affecting the rest of us," and it's for this very reason that a 15-disc box documenting Muir's short tenure with the group is essential listening for any who want to understand the impact that a single person can have on an entire group. That's not to deny to value of each and every member of the group. Cross may have ultimately become marginalized by the sheer volume and intensity of the post-Muir, LTIA-era Crimson, but he was by no means the weak link to which he is sometimes ascribed, based on his soloing on the 29-minute "Improv I: Vista Training College Under Spot Light" or, for that matter, his defining duet with Muir on the studio version of "Larks Tongues in Aspic (Part I)." And while he remains uncredited for it, he also turns out to be a more than decent flautist during the Beat Club 's " Improv: The Rich Tapestry of Life." Cross may have ultimately become marginalized simply because technology at the time made it next to impossible for him to be heard through what would become the sonic juggernaut of Wetton and Bruford-something against which even Fripp had to, at times, compete; but as a violinist, in particular, he's often been unfairly overlooked, and this box set certainly helps to right that wrong. Wetton may have been the least-sophisticated, linguistically speaking-for the most part, during the many improvisations that make up the live recordings, he sticks to pentatonic, blues-based foundations-but what he lacked in language he made up for in attitude, with a bass sound that could virtually shake the foundation of a live venue but, at the same time, become gentle-lyrical, even-when the moment called for it. Bruford would become a much looser drummer as the result of working with Muir, but his mathematical precision and unmistakable sound remained the cornerstones upon which his subsequent free excursions were built. He may have been the straight man to Muir's unfettered (and, even, comedic) approach; but throughout this box set, he plays with an energy and ferocity that would never have been possible with Yes, making his work with Crimson (and he would continue with various incarnations through to 1997) an essential stepping stone to his own solo work, with each one ultimately feeding the other. Fripp had, up to this point, never been as front-and-center with any previous Crimson lineup, but beyond his playing-which, paradoxically, had never been fiercer ("Larks Tongues in Aspic (Part I))" or more beautiful ("Book of Saturday," "Exiles")-he took a major leap forward here as a writer, bringing together classical elements (ranging from Bartók to Vaughan Williams), pastoral jazz tinges and no shortage of heavy metal-leaning aggression. This was all combined with an instrumental configuration that retained at least some of Crimson's symphonic tendencies-the unwieldy but wonderful Mellotron still an important sonic marker-but, equally, bore at least some comparison to guitarist John McLaughlin's seminal Mahavishnu Orchestra for its overall textural palette. Both groups featured guitar, bass, drums and violin, but if Mahavishnu Orchestra approached rock from a stronger background in jazz, Crimson's came from the opposite side of the equation: a rock group, to be sure, but one aspiring to the freedom intrinsic to the world of jazz. What other rock group of the time would make an appearance on Beat Club, playing two as-yet-unrecorded songs-"Exiles" and an early version of "Larks' Tongues in Aspic (Part I)"-and open with a full 30-minute free improvisation? How many groups with a mega-hit like In the Court of the Crimson King would eschew its back catalog almost entirely, throwing in "21st Century Schizoid Man" only, and as an encore? How many rock groups would, at their debut performance, occupy half of their two-hour set with completely free improvisation? When Islands 40th Anniversary Series was released in 2010, the bonus material revealed that Fripp was already working on "Larks Tongues in Aspic (Part I)" (there titled "A Peacemaking Stint Unrolls"), but rather than the hard-edged, thundering version the new quintet would record, this one was softer, more distinctly jazz-centric-more akin to the cleaner free jazz approach of "Groon," from the Poseidon sessions, rather than what was soon to come. It also becomes clear, in hindsight, just how unsuited the Islands band was for the music that Fripp was beginning to conceive. And if the Crimson live shows were weighted heavily towards improvisation, they were also testing grounds and laboratory opportunities for ideas that would eventually show up as compositions: "Improv: Fallen Angel," from the group's first gig already forming the basis for what would become "Fallen Angel" on Red, but here going to very different places, and again on "Improv: Fallen Angel Hullabaloo," from the Technical College gig in Hull on November 10, 1972. "Zoom," also from the first date at the Zoom Club, finds its way to at least part of the form that would later be used for Starless and Bible Black's "Lament." But more than just a testing ground for new ideas, this heavily improvising Crimson found its way to funky places to which the Islands band aspired but never achieved; surprisingly gentle moments on "Improv: Boolean Melody Medley," from Oxford on November 25, and near-mediaeval moments during "Improv: A Vinyl Hobby Job," at the Glasgow show on December 1. For those who want the more concise version, without all the bells and whistles, there are two double-disc versions of Larks Tongues in Aspic 40th Anniversary Series: a CD/DVD-A version that has Wilson and Fripp's new stereo mix, plus alternate takes and mixes of "Larks' Tongues in Aspic (Part I)," "Book of Saturday" and "The Talking Drum" on the CD, and the full contents of the box set's DVD-A, which includes, amongst other things, the new surround mixes plus the Beat Club video. 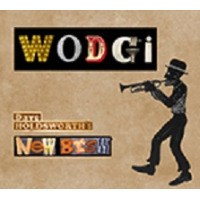 The two-CD set includes the first disc of the CD/DVD-A edition, plus a second disc with the 30th Anniversary remaster, a radio advert and vinyl promo edit. But beyond the live recordings, the absolutely riveting Beat Club audio/video, and Wilson and Fripp's tremendous 2012 remixes-which, like the rest of the 40th Anniversary Series, broaden the soundstage, whether in stereo or 5.1, creating greater transparency between the layers, clarifying details and giving the record a much bigger sound-the Larks' Tongues in Aspic box has a number of additional features that make it an essential listen for the pathological Crimhead. First, there's an audio CD of alternate mixes by Wilson alone, as well as an alternate take of "Book of Saturday" that's stripped down to just Wetton's voice and Fripp's warm electric guitar. There's an "Easy Money" stripped down to just Muir's tracks, revealing more than ever before exactly what his contributions were, how absolutely unfettered his imagination was, and how flat-out funny he could be. Wilson's alternate mix of "Larks' Tongues in Aspic (Part I)" shortens Cross' solo and eliminates the final climactic build, choosing instead to fade into Fripp's arpeggio-driven coda and push the layered spoken word tracks to the front of the mix. "Exile" features an uncredited trombonist and greater reliance on Fripp's chiming acoustic guitar, "The Talking Drum" pushes Muir's titular instrument to the front at the beginning of the piece while, beyond a false start, "Larks' Tongues in Aspic (Part II)" removes Cross' violin entirely. The disc ends with an alternate edit/mix of "Easy Money" by David Singleton and Alex R. Mundy, taken from the session reels, that removes both Muir's curious contributions and Cross' Mellotron and violin, leaving Fripp to take the lead and deliver a massive solo that includes part of the studio album's take, but others as well, before ending without a return to the final verse. But perhaps box set's most significant revelation, beyond the new mixes that are available in the two-disc versions, is Disc 10, Larks Tongues in Aspic Session Reels," with just one 80-minute track, "Keep That One, Nick" ("Nick," being Nick Ryan, the engineer on the sessions). Culled from the various recording dates, this is the closest thing to being there and experiencing how the album came to be, with a full 40 minutes devoted to various takes of various segments of "Larks' Tongues in Aspic (Part I,"), nearly 15 minutes of "Easy Money," and just a few short minutes for "Book of Saturday" (albeit in a version that may well trump the one ultimately used) and "Exiles." "Talking Drum" gets nearly 15 highly charged minutes; while a mere five are devoted to "Larks Tongues in Aspic (Part II)." Throughout, there's something very specific that may be an even greater revelation to those who haven't ever stepped foot into a recording studio and think that groups go in with great gravitas and lofty intentions. Groups don't go into the studio to record a masterpiece, they go into the studio to make a record, nothing more, and nothing less; a fact that demystifies the music and makes it all the more human. They might realize, as they are doing it, that they're onto something, but that's a byproduct, and not a premise with which they enter the studio. 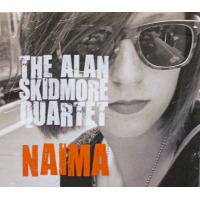 This may be a quintet about to break new ground and make some seriously serious music, but the sessions themselves were made by a relaxed group of people who were also having fun while they did it, with a clear sense of camaraderie audible throughout. 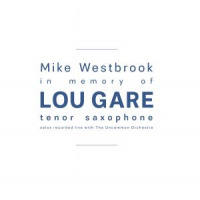 Even more surprising, while this disc sounds, on paper, like something that would be listened to once or twice and then shelved, it's so filled with terrific alternate takes that it becomes a completely compelling standalone document, one that absolutely stands up to plenty of repeat listens. It also clarifies Cross as a far more important contributor than subsequent work might suggest; a feeling also clear in the Beat Club video. Second to Muir-who, with his fur vest and charismatic performance, whether he's squeezing klaxons, blowing bird whistles or attacking his drum kit with an abandon that contrasts sharply with Bruford's greater precision, and absolutely justifies Fripp's early decision to use two percussionist-Cross gets plenty of attention, both as a player and from the film editor. King Crimson was more fortunate than most bands in its dealings with the record industry. That statement is not meant to detract from the fact the band was ripped off by record companies. Most, if not all, bands were similarly mistreated. Nor is it meant to diminish the fact that the band saw its material-master recordings and song-writing/publishing catalogue-sold to third parties without input or consultation, sold by the very people who were, at the time, charged with representing the band's interests. This has been a common experience for many musicians, the instances accelerated over the last two decades as the industry has shrunk, with major companies consuming the big independent labels of the 1960s and '70s-Island among them-prior to turning, cannibalistically, on one another. 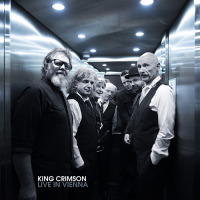 Thanks to the determination of band co-founder Robert Fripp, in a well-documented fight 1991-7 that included a London High Court writ, King Crimson is one of the all too few bands to now have full control over its master recordings. 'Fortunate' can be a highly relative term in the music industry. 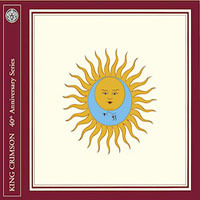 The fact of the matter is, were Crimson to still be beholden to traditional record labels, box sets like the In the Court of the Crimson King one and, more specifically, this Larks Tongues in Aspic edition, would simply never see the light of day, because it's unlikely that any major label would appreciate their intrinsic value, any more than they supported surround sound remixes when, a few years back, Steven Wilson approached Fripp with the idea of reissuing the entire Crimson catalog. Of course, the success of this project and others has now made surround sound editions the new moneymaker for major labels, though few do it this well-and Fripp has ensured, beyond new mixes, that the 40th Anniversary Series has plenty of extras on offer give them additional historical value and relevance. So consider ourselves "fortunate," indeed, that Fripp persevered in reacquiring the rights to the King Crimson catalog, and that he was open to the idea of new stereo and surround remixes that have given greater transparency and new life to the Crimson catalog. Had he not done so, there'd almost certainly never have been the opportunity to hear all this wonderful music, appreciate Larks' Tongues in Aspic for the landmark recording it is, and get the chance to really understand and appreciate how key Jamie Muir was to what this new incarnation of Crimson was...and would ultimately become, even after his departure. Tracks: Disc 1 (CD: The Zoom Club, Frankfurt, October 13, 1972): Larks' Tongues in Aspic (Part I); Book of Saturday; Zoom; Improv: Zoom Zoom. Disc 2 (CD: The Zoom Club, Frankfurt, October 13, 1972): Easy Money; Improv: Fallen Angel; Improv: Z'Zoom; Exiles; The Talking Drum; Larks' Tongues in Aspic (Part II). Disc 3 (CD: Live in the Studio, Bremen, October 17, 1972): Improv: The Rich Tapestry of Life; Exiles; Larks' Tongues in Aspic (Part I). Disc 4 (CD: Hull Technical College, November 10, 1972): Walk On (No Pussyfooting); Larks' Tongues in Aspic (Part I); Book of Saturday; RF Announcement; Improv: Vista Training College Under Spot Light; Exiles. Disc 5 (CD: Hull Technical College, November 10, 1972): Easy Money; Improv: Fallen Angel Hullabaloo; The Talking Drum; Larks' Tongues in Aspic (Part II); 21st Century Schizoid Man; John Wetton Interview. Disc 7 (CD: Oxford New Theatre, November 25, 1972 ): Larks' Tongues in Aspic (Part I); Book of Saturday; RF Announcement; Improv: A Boolean Melody Medley; Exiles. Disc 8 (CD: Glasgow Green's Playhouse, December 1, 1972 ): Larks' Tongues in Aspic (Part I); RF Announcement; Book of Saturday; Improv: A Vinyl Hobby Job; Exiles; Easy Money; Improv: Behold! Blond Bedlam. Disc 9 (CD: Portsmouth Guildhall, December 15, 1972 ): Book of Saturday; Improv: An Edible Bovine Dynamo; Exiles; Easy Money; Improv: Ahoy! Modal Mania; The Talking Drum; Larks' Tongues in Aspic (Part II); 21st Century Schizoid Man. Disc 10 (CD: Larks' Tongues in Aspic Session Reels): "Keep That One, Nick." 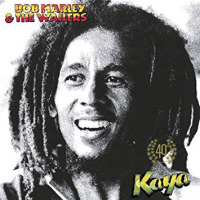 Disc 11 (CD: Original 1973 Stereo Mix, 30th Anniversary Remaster): Larks' Tongues in Aspic (Part I); Book of Saturday; Exiles; Easy Money; The Talking Drum; Larks' Tongues in Aspic (Part II); US Radio Ad; Easy Money (edit); Exiles (edit); Larks Tongues in Aspic (Part II). Disc 12 (DVD-A): Audio Content: MLP Lossless 5.1 Surround (DVD-A players and some Blu-Ray players), DTS 5.1 Digital Surround (DVD/Blu-Ray players and DVD-Rom/Blu-Ray drives), Surround Sound mix by Steven Wilson and Robert Fripp: Larks' Tongues in Aspic (Part I); Book of Saturday; Exiles; Easy Money; The Talking Drum; Larks' Tongues in Aspic (Part II). MLP Lossless Stereo (24/96) (DVD-A players and some Blu-Ray players), PCM Stereo 2.0 (24/48) (DVD/Blu-Ray players and DVD-Rom/Blu-Ray Drives), 2012 stereo album mix by Robert Fripp and Steven Wilson: Larks' Tongues in Aspic (Part I); Book of Saturday; Exiles; Easy Money; The Talking Drum; Larks' Tongues in Aspic (Part II). PCM Stereo 2.0 (24/48), Original 1973 Stereo Mix 30th Anniversary Remaster: Larks' Tongues in Aspic (Part I); Book of Saturday; Exiles; Easy Money; The Talking Drum; Larks' Tongues in Aspic (Part II). Alternate take and mixes: Larks' Tongues in Aspic (Part I) (alt mix); Book of Saturday (alt take); Exiles (alt mix); Easy Money (Jamie Muir solo); The Talking Drum (alt mix); Larks' Tongues in Aspic (Part II) (alt mix); Easy Money (alt take). Video Content (audio dual mono): Improv: The Rich Tapestry of Life; Exiles; Larks' Tongues in Aspic (Part I); Larks Tongues in Aspic (Part I) (as broadcast on Beat Club). Disc 13 (CD: Alternate takes and mixes): Larks' Tongues in Aspic (Part I) (alt mix); Book of Saturday (alt take); Exiles (alt mix); Easy Money (Jamie Muir solo); The Talking Drum (alt mix); Larks' Tongues in Aspic (Part II) (alt mix); Easy Money (alt take). Disc 14 (CD: The 2012 stereo album mix, mixed by Robert Fripp and Steven Wilson): Larks' Tongues in Aspic (Part I); Book of Saturday; Exiles; Easy Money; The Talking Drum; Larks' Tongues in Aspic (Part II). Disc 15 (Blu-Ray Disc): Audio Content: DTS-HD Master Surround 5.1, LPCM 5.1 Surround, The 2012 Surround mix by Steven Wilson and Robert Fripp: Larks' Tongues in Aspic (Part I); Book of Saturday; Exiles; Easy Money; The Talking Drum; Larks' Tongues in Aspic (Part II). LPCM Stereo (24/96), The 2012 Surround mix by Steven Wilson and Robert Fripp: Larks' Tongues in Aspic (Part I); Book of Saturday; Exiles; Easy Money; The Talking Drum; Larks' Tongues in Aspic (Part II). LPCM Stereo (24/96), Original 1973 Stereo Mix, 30th Anniversary Remaster: Larks' Tongues in Aspic (Part I); Book of Saturday; Exiles; Easy Money; The Talking Drum; Larks' Tongues in Aspic (Part II). Alternate take and mixes: Larks' Tongues in Aspic (Part I) (alt mix); Book of Saturday (alt take); Exiles (alt mix); Easy Money (Jamie Muir solo); The Talking Drum (alt mix); Larks' Tongues in Aspic (Part II) (alt mix); Easy Money (alt take). The Session Reels: "Keep That One Nick." LPCM Dual Mono (24/96) Live in the Studio: Improv: The Rich Tapestry of Life; Exiles; Larks' Tongues in Aspic (Part I). LPCM Stereo (24/96), Original UK vinyl transfer: Larks' Tongues in Aspic (Part I); Book of Saturday; Exiles; Easy Money; The Talking Drum; Larks' Tongues in Aspic (Part II). Original US vinyl transfer: Larks' Tongues in Aspic (Part I); Book of Saturday; Exiles; Easy Money; The Talking Drum; Larks' Tongues in Aspic (Part II). Video Content (audio LPCM dual mono): Improv: The Rich Tapestry of Life; Exiles; Larks' Tongues in Aspic (Part I); Larks Tongues in Aspic (Part I) (as broadcast on Beat Club). 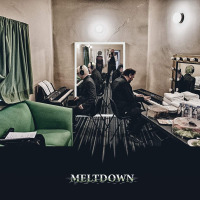 Personnel: Bill Bruford: drums; David Cross: violin, viola, flute, Mellotron; Robert Fripp: guitar, Mellotron, devices; Jamie Muir: percussion, allsorts; John Wetton: bass, vocals. Track Listing: Disc 1 (CD: The Zoom Club, Frankfurt, October 13, 1972): Larks' Tongues in Aspic (Part I); Book of Saturday; Zoom; Improv: Zoom Zoom. Disc 2 (CD: The Zoom Club, Frankfurt, October 13, 1972):Easy Money; Improv: Fallen Angel; Improv: Z'Zoom; Exiles; The Talking Drum; Larks' Tongues in Aspic (Part II). Disc 3 (CD: Live in the Studio, Bremen, October 17, 1972): Improv: The Rich Tapestry of Life; Exiles; Larks' Tongues in Aspic (Part I). 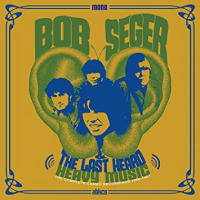 Disc 4 (CD: Hull Technical College, November 10, 1972): Walk On (No Pussyfooting); Larks' Tongues in Aspic (Part I); Book of Saturday; RF Announcement; Improv: Vista Training College Under Spot Light; Exiles. Disc 5 (CD: Hull Technical College, November 10, 1972): Easy Money; Improv: Fallen Angel Hullabaloo; The Talking Drum; Larks' Tongues in Aspic (Part II); 21st Century Schizoid Man; John Wetton Interview. Disc 6 (CD: Guildford Civic Hall, November 13, 1972): Larks' Tongues in Aspic (Part I); RF Announcement; Book of Saturday; Improv: All That Glitters is Not Nail Polish; Exiles Disc 7 (CD: Oxford New Theatre, November 25, 1972 ): Larks' Tongues in Aspic (Part I); Book of Saturday; RF Announcement; Improv: A Boolean Melody Medley; Exiles. Disc 8 (CD: Glasgow Green's Playhouse, December 1, 1972 ): Larks' Tongues in Aspic (Part I); RF Announcement; Book of Saturday; Improv: A Vinyl Hobby Job; Exiles; Easy Money; Improv: Behold! Blond Bedlam. Disc 9 (CD: Portsmouth Guildhall, December 15, 1972 ): Book of Saturday; Improv: An Edible Bovine Dynamo; Exiles; Easy Money; Improv: Ahoy! Modal Mania; The Talking Drum; Larks' Tongues in Aspic (Part II); 21st Century Schizoid Man. Disc 10 (CD: Larks' Tongues in Aspic Session Reels): "Keep That One, Nick." Disc 11 (CD: Original 1973 Stereo Mix, 30th Anniversary Remaster): Larks' Tongues in Aspic (Part I); Book of Saturday; Exiles; Easy Money; The Talking Drum; Larks' Tongues in Aspic (Part II); US Radio Ad; Easy Money (edit); Exiles (edit); Larks Tongues in Aspic (Part II). Disc 12 (DVD-A): Audio Content: MLP Lossless 5.1 Surround (DVD-A players and some Blu-Ray players), DTS 5.1 Digital Surround (DVD/Blu-Ray players and DVD-Rom/Blu-Ray drives), Surround Sound mix by Steven Wilson and Robert Fripp: Larks' Tongues in Aspic (Part I); Book of Saturday; Exiles; Easy Money; The Talking Drum; Larks' Tongues in Aspic (Part II). MLP Lossless Stereo (24/96) (DVD-A players and some Blu-Ray players), PCM Stereo 2.0 (24/48) (DVD/Blu-Ray players and DVD-Rom/Blu-Ray Drives), 2012 stereo album mix by Robert Fripp and Steven Wilson: Larks' Tongues in Aspic (Part I); Book of Saturday; Exiles; Easy Money; The Talking Drum; Larks' Tongues in Aspic (Part II). PCM Stereo 2.0 (24/48), Original 1973 Stereo Mix 30th Anniversary Remaster: Larks' Tongues in Aspic (Part I); Book of Saturday; Exiles; Easy Money; The Talking Drum; Larks' Tongues in Aspic (Part II). Alternate take and mixes: Larks' Tongues in Aspic (Part I) (alt mix); Book of Saturday (alt take); Exiles (alt mix); Easy Money (Jamie Muir solo); The Talking Drum (alt mix); Larks' Tongues in Aspic (Part II) (alt mix); Easy Money (alt take). Video Content (audio dual mono): Improv: The Rich Tapestry of Life; Exiles; Larks' Tongues in Aspic (Part I); Larks Tongues in Aspic (Part I) (as broadcast on Beat Club). Disc 13 (CD: Alternate takes and mixes: Larks' Tongues in Aspic (Part I) (alt mix); Book of Saturday (alt take); Exiles (alt mix); Easy Money (Jamie Muir solo); The Talking Drum (alt mix); Larks' Tongues in Aspic (Part II) (alt mix); Easy Money (alt take). Disc 14 (CD: The 2012 stereo album mix, mixed by Robert Fripp and Steven Wilson): Larks' Tongues in Aspic (Part I); Book of Saturday; Exiles; Easy Money; The Talking Drum; Larks' Tongues in Aspic (Part II). 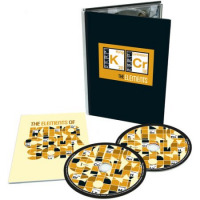 Disc 15 (Blu-Ray Disc): Audio Content: DTS-HD Master Surround 5.1, LPCM 5.1 Surround, The 2012 Surround mix by Steven Wilson and Robert Fripp: Larks' Tongues in Aspic (Part I); Book of Saturday; Exiles; Easy Money; The Talking Drum; Larks' Tongues in Aspic (Part II). LPCM Stereo (24/96), The 2012 Surround mix by Steven Wilson and Robert Fripp: Larks' Tongues in Aspic (Part I); Book of Saturday; Exiles; Easy Money; The Talking Drum; Larks' Tongues in Aspic (Part II). LPCM Stereo (24/96), Original 1973 Stereo Mix, 30th Anniversary Remaster: Larks' Tongues in Aspic (Part I); Book of Saturday; Exiles; Easy Money; The Talking Drum; Larks' Tongues in Aspic (Part II). Alternate take and mixes: Larks' Tongues in Aspic (Part I) (alt mix); Book of Saturday (alt take); Exiles (alt mix); Easy Money (Jamie Muir solo); The Talking Drum (alt mix); Larks' Tongues in Aspic (Part II) (alt mix); Easy Money (alt take). The Session Reels: "Keep That One Nick." LPCM Dual Mono (24/96) Live in the Studio: Improv: The Rich Tapestry of Life; Exiles; Larks' Tongues in Aspic (Part I). LPCM Stereo (24/96), Original UK vinyl transfer: Larks' Tongues in Aspic (Part I); Book of Saturday; Exiles; Easy Money; The Talking Drum; Larks' Tongues in Aspic (Part II). Original US vinyl transfer: Larks' Tongues in Aspic (Part I); Book of Saturday; Exiles; Easy Money; The Talking Drum; Larks' Tongues in Aspic (Part II). Video Content (audio LPCM dual mono): Improv: The Rich Tapestry of Life; Exiles; Larks' Tongues in Aspic (Part I); Larks Tongues in Aspic (Part I) (as broadcast on Beat Club).